an endoscope especially designed for passage through the trachea to permit inspection of the interior of the tracheobronchial tree and carrying out of endobronchial diagnostic and therapeutic maneuvers, such as taking specimens for culture and biopsy and removing foreign bodies. adj., adj bronchoscop´ic. 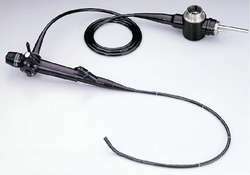 An endoscope for inspecting the interior of the tracheobronchial tree, either for diagnostic purposes (including biopsy) or for the removal of foreign bodies. There are two types: flexible and rigid. A slender tubular instrument with a small light on the end for inspection of the interior of the bronchi. a curved, flexible tube for visual examination of the bronchi. It contains fibers that carry light down the tube and project an enlarged image up the tube to the viewer. The bronchoscope is used to examine the bronchi, to secure a specimen for biopsy or culture, or to aspirate secretions or a foreign body from the respiratory tract. See also fiberoptic bronchoscopy. bronchoscopic, adj. A thin, flexible, lighted endoscope used to examine the upper airways, vocal cords and tracheobronchial tree to the 4th to 6th division, obtain diagnostic material (i.e., biopsies, brushings, washings), and instil medicine and mechanics for easy guidance through the tree. Bronchoscopes may have a halogen or xenon light source, a 2–2.5 mm channel. Pulmonology A thin, flexible, lighted endoscope used to examine the upper airways, vocal cords, and tracheobronchial tree to the 4th to 6th division, obtain diagnostic material, ie biopsies, brushings, washings, and instill medicine, and mechanics for easy guidance through the tree. See Bronchoscopy. An endoscope for inspecting the interior of the tracheobronchial tree. A lighted, flexible tube inserted into the windpipe to view the bronchi or withdraw fluid samples for testing. Bronchoscopy with a protected brush can be used in the diagnosis of lung abscess in severely ill patients. n a curved flexible tube for visual examination of the bronchi. an endoscope especially designed for passage through the trachea to permit inspection of the interior of the tracheobronchial tree and carrying out of endobronchial diagnostic and therapeutic maneuvers, such as taking specimens for culture and biopsy and removing foreign bodies. 12) Although Fibreoptic bronchoscope is less useful in diagnosis of peripheral lesions, particularly small peripheral lesions of less than 2cm diameter it has special importance in diagnosis of central lesions. Global corporate-level profiles of key companies operating within the United States Bronchoscopes market. A video bronchoscope Pentax SAFE 3000 (Model EB-1570 AK, Pentax, Tokyo, Japan) was then inserted via the trocar and the pleural cavity was inspected after all the fluid had been drained. This is not the first time that infections caused by Olympus bronchoscopes have been reported. Bronchoscopes are small flexible tubes the width of a pencil that are inserted through a patient's nose or mouth into the windpipe. In July 1998, the facility began processing bronchoscopes and other endoscopes using a STERIS System i processor. Therefore, the Negus bronchoscope was used instead, with modified jet ventilation. Beginning in May 1988, bronchoscopes and endoscopes from the surgical service had been reprocessed after each use with a Keymed Auto Disinfector 2 (manufactured by Olympus Corporation), which washed the endoscopes with a detergent solution, disinfected with 2. Our technology does not have the small, difficult-to-clean mechanical components used on conventional bronchoscopes that have long been the subject of infection control monitoring. Contract notice: Bronchoscopes and osteosynthesis system purchase. Retrieval of such objects is usually relatively straightforward using ventilating bronchoscopes and 'grabbing' forceps. InnerSpace is offering three new small diameter scope cabinets that are ideal for storing bronchoscopes, cystoscopes, ureteroscopes and other small diameter flexible endoscopes.